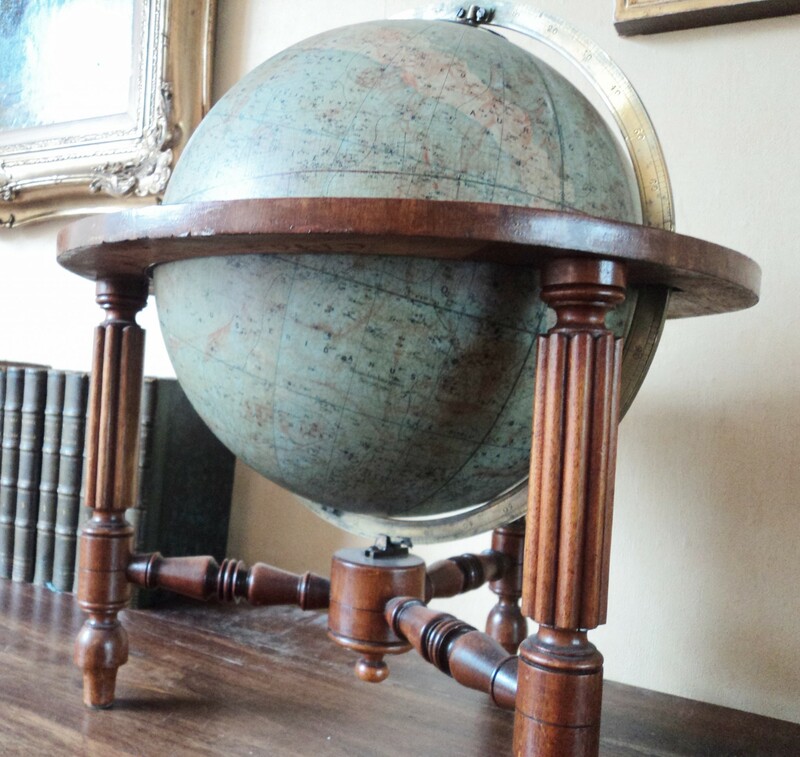 Mid-19th century tabletop celestial globe on stand by Thomas Malby & Son. Globe surmounted by polar brass hour circle, and within calibrated full brass meridian, the horizon band with engraved paper calendar and zodiac, raised on a turned mahogany stand with turned legs united by stretchers. With constellations shown by boundaries in hatched lines, and as classical figures and scientific instruments in tones of brown, key identifies different typefaces for constellations or stars named or discovered respectively in ancient or modern times and by Piazzi, Bradley, Hevelius, Mayer, le Caille and Johnson. Malby & Son was one of the most prominent British globemakers of the mid 19th century. The cartography on the globes was based on the work of the map publisher “The Society of the Diffusion of Useful Knowledge.” The Malby firm is perhaps best known for producing in 1849 a 92 centimeter (about 3 foot) diameter terrestrial globe for public exhibition, which was a reissue of John Addison’s 1825 terraqueous globe.